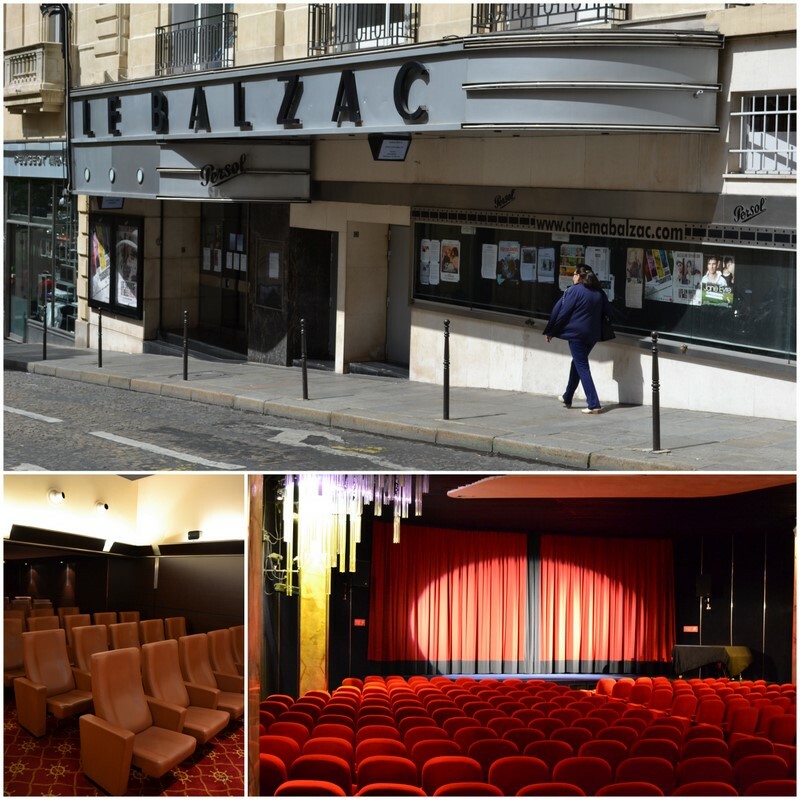 Le Balzac, situated just off the Champs Elysées, is one of the last remaining independent cinemas on the city’s right-bank. With the district now dominated by international brands that independence has become more and more difficult to preserve, but the establishment’s owner is determined to continue winning the battle. Jean-Jacques Schpoliansky gives the impression of being a happy man. He has been looking after the Le Balzac cinema since his father’s death in 1973, but his passion for film is seemingly undimmed. Indeed, Schpoliansky is known to cinephiles in the city as the man who stands on stage and introduces the films, something which he says gets him recognised as ‘Mr Balzac’ across Paris. We are sitting in his office, a small box above the ticket desk and cafe, and a space which also functions as the cinema’s archives. Although the office is strewn with the clutter of a hoarder, the historic documents and press clippings are filed carefully into binders. The cinema was opened in 1935 by his grandfather, and he shows me the articles that were published in the French press the day afterwards. He is clearly proud of this family story, but also keenly aware of his role as preserver of the heirloom. The cinema has seen many twists in its 80 years, but he is desperate to ensure that the curtain doesn’t drop on the establishment when his own personal career ends. At some point it will be time to pass the responsibility on to the next generation, but it seems unlikely that much will change. Schpoliansky readily admits that computers and social media are not his thing, and although he has staff who look after these aspects, the cinema itself has made little concession to changes in technology. You will not find films shown in 3D here, and Schpoliansky is against digital film. Walking along backstage corridors stacked floor to ceiling with cans of film, and through projection rooms where celluloid is being carefull wound into projectors, it is clear that this is still a place where vintage technology rules. Schpoliansky looks back with nostalgia on the 1950s and 60s when Le Balzac pulled in upwards of 400,000 spectators a year, but he knows that such figures are impossible for everyone today. “If we have 170,000 spectators in a year – and that over three screens – I break open the champagne” he tells me, but the story is the same for the neighbouring establishments. The Champs Elysées counted 65 screens in 1970, but only 35 remain today. However, Schpoliansky recognises that France – and Paris in particular – still has an exceptional breadth and quantity of cinemas in comparison to almost any other country in the world. Although his cinema might find life easier in a different district of Paris, Schpoliansky remains deeply committed to the Champs Elysées, an area that he believes can become a culturally important part of the city again. On a personal level it is also a place with very strong family links. “I remember walking here with my father, and it would take us about three hours just to cross the road. He knew everybody” he explains. Bringing cultural life back to this district is one of his battles, but he also readily describes his personal mission at the cinema as a ‘combat’. It’s a fight to survive in difficult financial times, as well as in an area that – as Schpoliansky points out – “has been abandoned by Parisians”. However, he also sees his role at Le Balzac as being a fight to offer something different to cinema-goers, to ensure that spectators at his cinema are not just purchasers of tickets and snacks, but instead people that are “partipicipating in an adventure”. Keeping the cinema alive is one challenge, but he also wants to ensure that the medium of film continues to play a small role in society. The audience at Le Balzac know that each film has been carefully chosen by a programmer – not a pushy distributor - and that the films follow a logic which Schpoliansky describes as being ‘editorial’. The cinema’s niche is low-budget independent films with a message. Schpoliansky is keen that the films should not just be passive entertainment, but offer a perspective and a viewpoint. However, Le Balzac is far from being a highbrow amusement-free establishment. Already there is the omnipresent Schpoliansky, a man who sports the lines of someone who has spent much of his life smiling. Then there is the cinema itself, which is also in its way an interesting – and slightly eccentric - monument. The clean 1930s lines are still visible, mixed with curious touches chosen by Schpoliansky in the 1970s. The entrance has a nautical theme (Schpoliansky’s single window in his office is a porthole that looks down onto the foyer), and sailing-themed carpets stretch throughout the cinema. The main auditorium is theatrical, with deep red seats, a stage and a spotlight for Schpoliansky’s pre-film presentations. At the rear of the building, the very cosy screen three (which is positioned in what was the office of Jean-Jacques’ grandfather) is vintage-style, with brown leather chairs that Schpoliansky describes as “the most comfortable in Paris”. The cinema is one of the city’s survivors, but Schpoliansky recognises that this longevity is also because it has expanded beyond just showing films. “I have a wonderful team who create events, and it is our goal to offer the ‘exceptionnel au quotidien’” he explains. These events include vintage film screenings accompanied by a live piano score for children on the first Sunday of each month, retransmissions of Opéra performances from around the world with champagne served in the foyer, and occasional gastronomic events organised by the cinema’s Michelin-starred neighbours. The standard film screening though can also be an out of the ordinary experience - the audience for the latest Ken Loach film, The Angels’ Share, for example were recently treated to a tasting of Balvenie whisky at the end of a screening. This then is no ordinary cinema, even if Schpoliansky wants it to be a place that supports “an ordinary cinema”. You will not find popcorn or sweets in the foyer (“what a horrible idea” says Schpoliansky), only the “best coffee, biscuits and teas”. Elitist perhaps? Undoubtedly, but with the cinema industry having dumbed-down to such an extent over recent years, we should be thankful that an independent cinema that assumes its audience has a brain can still exist. The cinema opens for the first time with a screening of Wedding Night featuring Gary Cooper. Beginning life as a kind of agency for the 20th Century Fox studios, this is the first of the three principal eras of the cinema. Typical pre-war screenings at Le Balzac are therefore based around double bills featuring the likes of Shirley Temple and Charlie Chan. Although the Champs Elysées later became recognised as the centre of the French film industry, it arrived quite late on the scene. In the 1920s there were only two cinemas on the avenue, with the majority of screens at the time being situated on the city’s Grand Boulevards, or out on the periphery of the city. With the German army approaching Paris, the Schpoliansky family are obliged to flee Paris and the cinema is forced to close. The family return to Paris and begin a fight to win back their cinema, but must begin again without Jean-Jacques’ grandfather who had died, in 1942, during their exile. The cinema reopens, with Jean-Jacques’ father now at the helm. This is the beginning of the second era and for Jean-Jacques the golden age. For 23 years the cinema is associated with three others on the city’s right-bank, and sits at the forefront of the French film industry. With the Helder (near Opéra, closed in 1988 and today a McDonalds, the Scala (in the 10th, closed in 1999 after operating as a pornographic cinema for nearly 20 years) and the Vivienne (in the 2nd, closed in 1989 and since demolished), Le Balzac actively supports the rise of the nouvelle vague and French films d’auteurs. Jean-Jacques takes over the running of the cinema following the death of his father. The third era begins in a period becoming more and more morose, with cinemas beginning to close across the city. Jean-Jacques nevertheless chooses to expand the cinema two years after taking over. Space is found for the creation of two new screens without the need to alter the main auditorium. Jean-Jacques closes the cinema’s third screen for a week in protest at the worsening relationship with French film distributors. The action is a success, gaining him wide press coverage and forcing the distributors to rethink their conditions. This time Jean-Jacques closes the whole cinema for a week, once more in protest at the distributors. With the large multiscreen complexes attempting to cover all markets, Le Balzac finds its traditional offer becoming more and more squeezed. “I’m obliged to do this every 20 years” he explains, but once again the operation is judged a success. Click here to visit the official website of Le Balzac where you can sign up for the newsletter and join the 'club' which offers a series of advantages to regular visitors. I have very fond memories of this cinema. I've only ever been to one film premier in my life and it took place here. It was the premier of a film made for French TV before a specially invited audience which included the the cast, the crew, the Director, his friends, the press and odd bods like me. I remember both the premier and the cinema with great affection. I remember the intimacy and complete unpretentiousness of the place. Wonderful! I hope he wins his battle. Des: I think you've captured the spirit of the place perfectly. Whilst I have accepted in my post that it is not an ordinary cinema, it is nevertheless a completely unpretentious place and very welcoming. YEEESSSS! I'll be there soon. Fab article...your blog is so good. Merci beaucoup. Wonderful article, a nice cinema where I went frequently, but now I have a tendency to more often go to the "Studio 28", the oldest still running cinema in Paris and closer to where I live. I will try to renew my visits to "Balzac". oh your blog is providing such good information for my upcoming trip in mid-September and again I feel that 10 days is just not enough. I tried.